It is a not so well kept secret that performance enhancing drug testing is all but non-existent in amateur mixed martial arts competitions. While addressing doping at the elite professional level is important, it is equally valuable to weed out a culture of cheating at the entry level to meaningfully address a potentially dangerous problem. To this end the International Mixed Martial Arts Federation, a body looking to become a worldwide governing body for the growth and development of the sport, have announced their anti-doping policy. 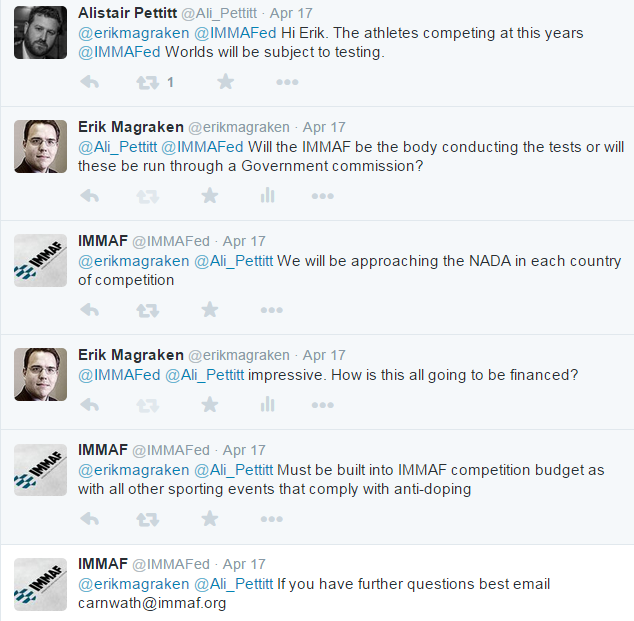 In short the IMMAF have adopted WADA prohibited list and will start enforcing this anti doping program in May, 2015 for events associated with them. These standards will be in force for the 2015 IMMAF World Championships of Amateur MMA scheduled to take place in July in Las Vegas.